A rendering of the interior of Noon All Day. Courtesy of Sagan Piechota Architecture. 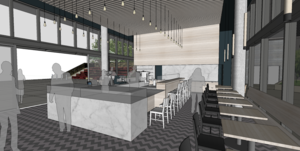 A rendering of the counter area of Noon All Day. Courtesy of Sagan Piechota Architecture. 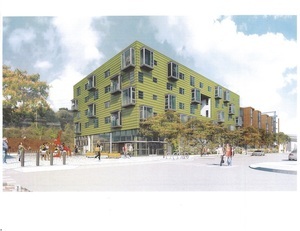 A rendering of the exterior of the building and plaza. Some great news for Dogpatch—the Piccino family (owners Margherita Stewart Sagan and Sher Rogat and director of operations Kerry Glancy) are busy working on the opening of a new project, ~NOON ALL DAY~, slated to open this summer at 690 Indiana. It will be flanking Esprit Park and the upcoming Dogpatch Arts Plaza, a dead-end street being converted into an arts-focused public pedestrian plaza (at 19th and Indiana) by Build Public, a local nonprofit committed to designing and developing more public spaces. Music, a farmers’ market, and more are also being programmed for the plaza. The location is also conveniently close to the UCSF Benioff Children’s Hospital and will be a godsend for the many doctors, residents, patients, and visitors. The space is just 1,1100 square feet—full of glass windows and opening out onto the plaza—and will have around 65 seats. There will be a full kitchen, so it’s almost like a mini restaurant with coffee service. The small and focused menu will be market fresh and seasonal (some ingredients will be coming from a mini farm up in Healdsburg), with six to eight rotating items that will be taking easy inspiration from many cultures, from a curry clay pot dish to fried rice to za’atar making an appearance. There will be braises and homey favorites like chicken soup stracciatella with egg—they’re also taking the famed Piccino meatballs and working on a mini meatball pocket sandwich. Look for special baked things as well: one item they are developing is a seedy and bready cylinder with a runny egg inside. Hospitality is a big component of the experience—they will have a concierge at the entrance who will facilitate your order. (This person will help direct people to order at the counter, or maybe a guest just wants to pay for an espresso and go pick it up at the coffee counter.) Food will be brought to your table via food runners who will know the ingredients well. There will additionally be an app, which people can order directly from, and have a lunch or afternoon snack delivered, or dinner to take home. The name is inspired by the fact that noon is often a reset time, a moment to recharge and take a breath, but this place will give you that feeling all day, whether you are coming by for coffee and pastry in the morning or some soft-serve ice cream with housemade toppings in the afternoon. The space (by Sagan Piechota Architecture) is bright and airy, with lots of glass and light wood and pendant lights. 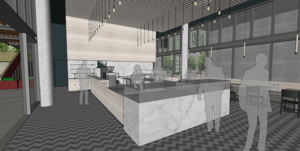 There will be a herringbone concrete-tile floor, a counter for seating (along with tables and chairs), and there’s a custom 10-foot refrigerated case with different temperature zones wrapped in marble (it will have some grab-and-go items). Beer and wine will be available, and they are hoping to secure a license for off-premise sales as well, so you can bring that bottle of rosé home that you like so much. They are hoping to open in the summer, perhaps June or July. Hours will be 6am-8pm daily. In the meantime, you can follow their progress on Instagram at @noonallday. 690 Indiana St. at 19th St.